David Williams of Euro Millionaire System claims that you can achieve financial freedom within weeks using their trading system. Is it too good to be true? More importantly, is Euro Millionaire System a scam? Let’s find out in our Euro Millionaire System review. Euro Millionaire System isn’t exactly risk free. In fact, it’s all about taking MASSIVE risks. Euro Millionaire System is a relatively popular binary trading software in the sea of binary trading software scams. Based on the risk-free promises that their sales pages give you, Euro Millionaire System qualifies as a scam. When you arrive at euro-millionaire-system.biz, you’ll realize that the homepage of Euro Millionaire System is exactly like any other scams out there – complete with a bogus headline and an unrealistic sales video. David Williams, the alleged owner of Euro Millionaire System starts off the video by promising you financial freedom within weeks, and how you can afford sports cars and nice mansion just by using his effortless Euro Millionaire System. David touts his system as risk-free and is guaranteed to work, but I beg to differ. Read on to find out Euro Millionaire System actually works, and the massive risks that comes with it. Before we continue the review, we’ll talk about how binary trading works to make sure everyone is on the same page. If you have experience in trading binary options, you can skip this segment. To put it simply – binary trading is trading stripped down to its simplest form. Instead of analyzing financial charts and reading up news, with binary trading, you only predict if the price of an asset will rise or fall after a short period of time. You either win, or you lose. There is no middle ground (hence the name binary options, or two options). This is how it works – Let’s say I predict that the market of EURUSD will rise after 30 minutes, and I bet $50 on a 30-minutes contract. If I’m right, I win a certain percentage of what I bet. With Euro Millionaire System, they claim that the winning payout is 77%, making the winning payout $38.5. However, if I’m wrong, I lose the entire $50 that I bet. You should’ve probably realized by now that trading binary options is just like your average gambling. There’s no good way to make an educated guess on the market movement in such a short period of time. Even if you manage a decent 50% win rate, you’ll still lose money due to the uneven winning vs losing payout of binary options. Please note that we do not recommend binary options if you want to make serious money online. There are simply better alternatives out there that are much more promising than trying to gamble your way to wealth. How Does Euro Millionaire System Work? Euro Millionaire System uses their Trading Sentiment Tool to find out which direction the majority of traders are following. David Williams claims that you can use the “wisdom of the crowd” to make your trading decisions. However, that is not all. 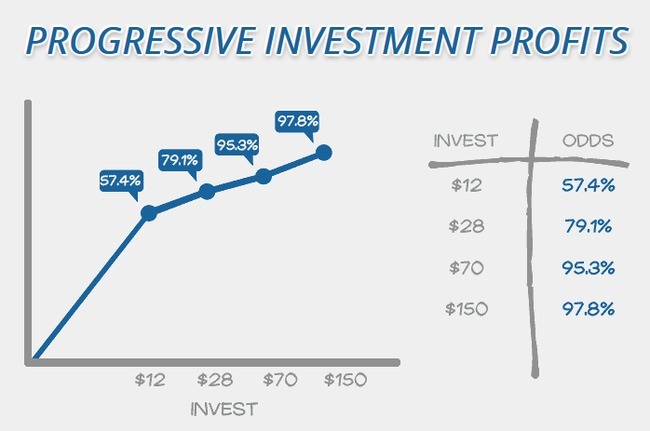 You have to follow a series of steps, which David calls the progressive investment profits to work in conjunction with the Trading Sentiment Tool. Start by choosing a dominant color on the Trading Sentiment Tool, which allows you to follow the decision of most traders. Start by investing $12. If you win the trade, you will be rewarded 77%, or a $9.24 profit. Repeat step 1. If you lost your $12 investment, David Williams wants you to bet $28 in the second trade. Do the same by following the dominant color on Trading Sentiment Tool. If you win the trade, you will be rewarded 77%, or a $21.56 profit. Go back to step 1. If you lost your $28 investment, you should bet $70 in the next trade. Again, do the same by following the dominant color on Trading Sentiment Tool. If you win the trade, you will be rewarded 77%, or a $53.90 profit. Go back to step 1. If you lost your $70 investment, you should bet $150 in the next trade. Follow the Trading Sentiment Tool. If you win the trade, you will be rewarded 77%, or a $115.50 profit. Go back to step 1. Do you see the pattern here? David Williams is betting on wiping out the previous losses with a single winning trade, thus the exponentially increasing bet amount. But will it work? Does Euro Millionaire System Work? Turns out the method David is describing has been around since the 18th century in France, and it’s called the Martingale betting system. The strategy has the gambler double his bet after every loss, so that the first win would recover all previous losses, and produce a marginal profit. The strategy will work well if the gambler has infinite wealth, since he will almost certainly win once sooner or later. But unfortunately, most of us don’t have infinite wealth. The losses add up exponentially! The increment in trade amount may seem insignificant initially. 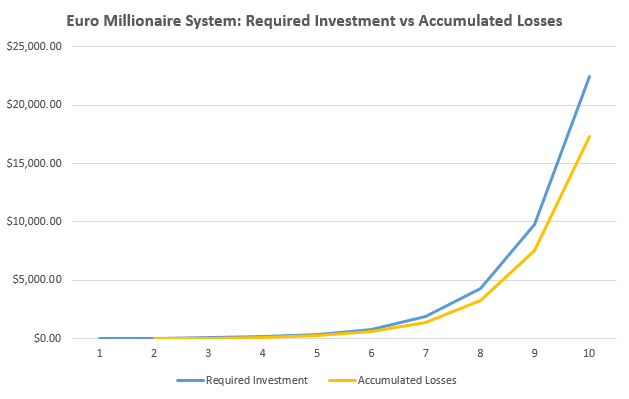 Since the idea of the Martingale system is to recoup the previous losses and make a marginal profit, the subsequent bet has to cover all the accumulated losses. Based on 77% winning payout as claimed by Euro Millionaire System, I’ve generated the table above outlining the required investment in each cycle of subsequent investment. For example, during your 2nd bet, you are required to put down $28 as instructed by David Williams. If you win that round, you will generate $21.56, off-setting the previous loss of $12 and generating a profit of $9.56. If you had to go to 3rd bet, you would’ve lost $40 on the first 2 rounds. If you manage to win the 3rd bet, you’ll generate $53.90, wiping out the previous losses and generating a profit of $13.90. So far so good. But if you follow the table, you’ll realize that the bet amount and accumulated losses start to sky rocket. By the end of 8th round, if you are still hitting a losing streak, you would’ve lost $3260 from the previous rounds and you need to bet $4,250, just to make a meager $12.50 overall profit. This, combined with the fact that strings of consecutive losses actually happen more frequently than you think, can bankrupt any trader very quickly. Would you bet $4,250 just to potentially make a $12.50 profit? If you think that betting on “wisdom of the crowd” can help you prevent losing streaks, think again – majority of binary options traders lose money. The majority can be wrong more than 50% of the time. Why Does David Williams Promote Euro Millionaire System? You may wonder why David Williams makes so much effort to promote Euro Millionaire System just to give it away for free. 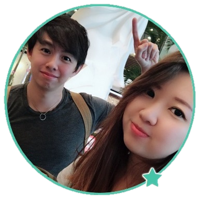 If you decide to join Euro Millionaire System, you’ll be required to sign up with their affiliated broker, StockPair. David Williams and the team behind will earn a sum of referral fees as soon as you make your first deposit. The minimum deposit is $200, and keep in mind that you must open a new broker account from Euro Millionaire System to use their Trading Sentiment Tool. However, considering the Martingale betting system employed by Euro Millionaire System, you’ll wipe out your $200 deposit in no time. Is Euro Millionaire System a Scam? Yes, Euro Millionaire System is a scam. As we’ve said in the review earlier, we don’t recommend binary options trading as a way to make money online, at all. It’s basically the same as gambling, and using Martingale system only puts you in even greater risks. You are essentially putting your hopes and entire investment in an unfavorable gamble. You are more likely to end up losing all your money than making any significant profit. If you have some cash to spare for entertainment, you’ll be better off spending it on a nice dinner with your loved ones.